The Avengers: Age of Ultron began shooting last month in South Africa, and the Hulk was front and center … at least, in spirit: A giant green Hulk head on a pole was used to terrorize extras and onlookers during a scene of mass destruction. 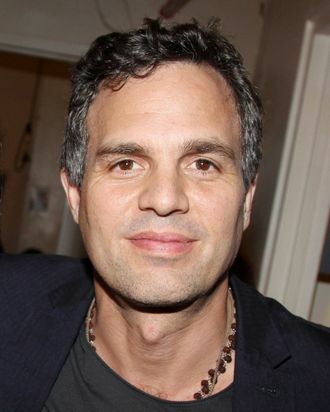 Was the Hulk’s mild-mannered portrayer, Mark Ruffalo, on set as well? “The Twitter-verse is all alive with that [question]!” said Ruffalo last night when Vulture caught up with him at Peggy Siegal’s party for the HBO series Doll & Em. “I actually already shot a lot of that stuff, we did it on motion capture, so we did a lot of that on a stage. So they’re doing all the [background] plates for that now in South Africa, and then I start work in mid-April.” That will give Ruffalo his first opportunity to reunite with the newly pregnant Scarlett Johansson — “They’re going to shoot a lot of closeups [of her],” explained the actor — as well as Robert Downey Jr., whose rapport with Ruffalo in the first Avengers movie inspired the BFF-y Science Bros. fandom. Will we get more Bruce-Tony one-on-ones in the sequel? “I’m guessing you will,” teased Ruffalo, who just read the script. As for the rampant rumors that Bruce Banner may have a legitimate love interest this time around, Ruffalo’s wide grin told the tale. “That may or may not be true,” he said coyly.